Richmond Provost, Phil Deans and Director of RIASA Mark Ellis celebrate the signing of a new contract in light of the recently achieved unique US/UK dual accreditation status for all their degree programmes. Our continued partnership with Richmond, The American International University in England is an integral part of our operation. 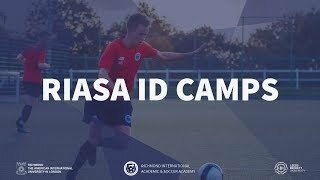 Not only is the RIASA soccer academy run to a professional standard, but we are also proud that the academics are delivered to an equally high standard by our talented and committed team of academic staff. The newly signed contract ensures that our mutually beneficial partnership continues for the foreseeable future, allowing us to continue to provide the opportunity for RIASA student-athletes to earn a US/UK degree in a pro UK soccer environment.